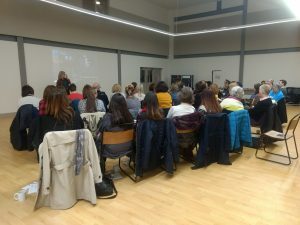 Beech Lodge School and Fagus hosted a free screening of “Resilience – The Biology of Stress & The Science of Hope" on the 13th February 2019. The film, directed by James Redford, is an award-winning 1 hour documentary that delves into the science of Adverse Childhood Experiences (ACEs), explores how extremely stressful experiences in childhood can alter brain development and have lifelong effects on health and behaviour and how addressing stress and promoting resilience in individuals’ lives using cutting edge brain science can stop cycles of adversity and disease and positively impact health and well-being. For questions about the screening, please contact Tracy Davies by email at tracy.davies@fagus.org.uk or call 01628 367358. The response to the film was extremely positive and we hope to screen the film at Beech Lodge School again soon. If you would like to be informed of any up-and-coming screenings, please register your interest here. Toxic stress is a chronic activation of a physiologic response to stressors when there is no buffering protection, or support. The ACE studies and subsequent related research quantified the physiological effects of stress and suffering, but spiritual cultures have understood the relation between body and mind for eons and clinicians have observed and documented it for decades. The film Resilience contains a wealth of technical information about child development and how developing bodies and brains respond to stress, and offers steps everyone can take to promote resilience in children. The above link provides a useful website for more information about what ACES are, the impact of ACES, how they can be prevented and how a collaborative approach and early intervention could be the key to tackling the public health issue of ACES. There is also a very good animation which is very thought-provoking. We need to focus on the need to understand brain structure and the idea that supporting healthy child development cannot be on one person’s shoulders – it takes a community of engaged members to support the healthy development of children. We need to build resiliency skills at a young age so children have the sturdy brain architecture that leads to healthy development and a prosperous future. Children are not born fully formed, so we have the opportunity to build their brains through love and stable, nurturing relationships and environments. The presence of a stable, caring adult is one of the keys to building resiliency. Children learn from people they trust, but more than that, children learn - and grow - when connections are made between them and adults they can trust. With these connections, ideas and support can be shared back and forth between them. Paying attention to young children’s emotional and social needs, as well as to their mastery of literacy and cognitive skills, has the maximum impact on child development. According to this view, because the brain is a highly integrated organ and its multiple functions operate in a richly coordinated fashion, you cannot focus on developing just one part of the child without paying equal attention to the other capacities. Toxic Stress is the repeated over-exposure of a developing brain to stress hormones in early childhood and is associated with such things as extreme poverty or maltreatment. While positive stress is short-lived and tolerable stress is alleviated by the presence of stable relationships, toxic stress lasts longer. Trying to change behaviour or build new skills on the foundation of brain circuits that were not formed properly when they were first formed requires more work and is less effective. It is better to focus on forming safe, stable nurturing relationships and environments early and preventing the effects of toxic stress because it is less costly and more effective than late-stage interventions.